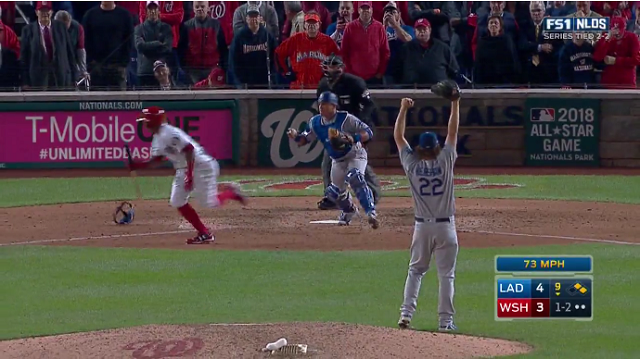 The Los Angeles Dodgers are off to the NLCS after finishing off the Washington Nationals with an amazing Game 5 victory that included Game 4 starter Clayton Kershaw coming in to nail down the save. But, the Nats scored two runs themselves in the bottom half of the seventh, and in the bottom of the ninth were threatening vs Dodgers closer Kenley Jansen who was on his third inning of work. Jansen understandably was running out of gas, and at pitch no. 51 (a career-high) with runners on first and second, Los Angeles manager Dave Roberts pulled Jansen… in favor of Kershaw. So, the Dodgers will now face the Chicago Cubs in the NLCS, with Game 1 set for Saturday night at Wrigley Field. It will be interesting to see if Kershaw being used tonight will impact what game he is started in the series, as it was previously assumed he’d be able to go Game 2 on Sunday.